Thinking about purchasing a new motor for your boat? Sterndrive (also known as inboard/outboard) and outboard are two of the most popular styles of boat motors. They both offer powerful and efficient methods of propulsion for watercraft of all sizes. If you’re struggling to choose between a sterndrive and outboard motor, keep reading to learn some of the distinguishable characteristics between these two styles. A sterndrive motor offers the power of an inboard motor with the drive of an outboard. The actual engine rests directly in front of the transom, and the drive unit is outside the hull. Boats which use a sterndrive motor are steered by turning the outdrive, which eliminates the need for a rudder. When loaded on a trailer, the outdrive is simply pulled out to avoid damage. One of the advantages of choosing a sterndrive motor is its fuel efficiency. Dollar for your dollar, you’ll get more miles out of a sterndrive motor than an outboard motor. This is a huge advantage for individuals and families who take their boat out to the lake on a regular basis. The main disadvantage of sterndrive motors is their susceptibility to damage. With all of the hoses, bellows and oil lines directly exposed in the water, there’s a greater risk of damage. Damage can occur from hitting rocks and other objects, or it may occur from corrosion. 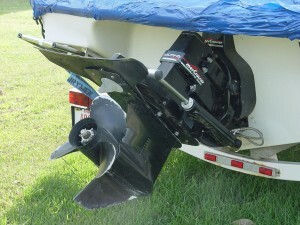 This is why it’s important for boat owners to raise their motors when traveling through shallow waters. The most common and widely used type of boat motor is the outboard motor. It features an enclosed box-like design which contains the engine, propeller (or jet drive), and gearbox. Outboard motors can be pivoted upwards when traveling through shallow waters to prevent hitting rocks or other debris that could damage the propeller. Compared to sterndrives, outboard motors are easier to maintain. Maintenance requirements vary depending on the size, brand, and model, but most owners will agree that outboards are easier to maintain. Being that outboard motors are designed in an enclosed box, boat owners can lift them entirely out of the water when they aren’t being used. In doing so, the propeller remains protected against rust and corrosion – a benefit that’s not found in sterndrive motors. Another key advantage of outboard motors is their cost. Of the three different types of motors – sterndrive, inboard, and outboard – outboards are typically the lightest.